Other Things That Didn’t Happen Either. IF IT SHOULD BE TRUE WE PRETEND IT IS. So I was telling someone at the bar about the time I punched out Jesse Ventura, and this dude named Loddy, whom I will refer to as Steve, from here on to protect his identity, and because I don’t want to keep typing the name Loddy, told me that he too had punched Jesse Ventura out once. ‘Yeah, so I was at the in North Dakota DMV getting my driver’s license renewed, and I seen this big tall old guy at one of the windows arguing with the lady behind the glass. I gave up my place in line to move closer to him, since he seemed to be getting loud and boisterous. Also, I believe either he or I may have been drunk. “Out of his garbling I heard some words about how he people who worked at the DMV didn’t know what it was like to stand in line at the DMV since they work there and are always the next available customer if they need something, and probably get a sweet employee discount even on custom vanity license plates. Then I heard something about the DMV deserving to lose a few of its own on our nation’s decrepit highways, and I snapped. 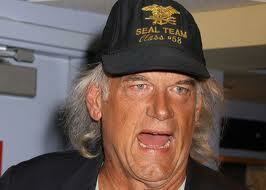 “I took a moment of silence, and gave Jesse Ventura a moment of face punching. ”The blow sent him reeling back into the glass partition which separates the masses from the coveted plastic stickers and the begrudging DMV employees who dole them out. His head cocked forward, cocked differently from how it had been cocked just prior to the punch though still very cocked. Then his whole body cocked forward and he hit the floor bam boom splat.